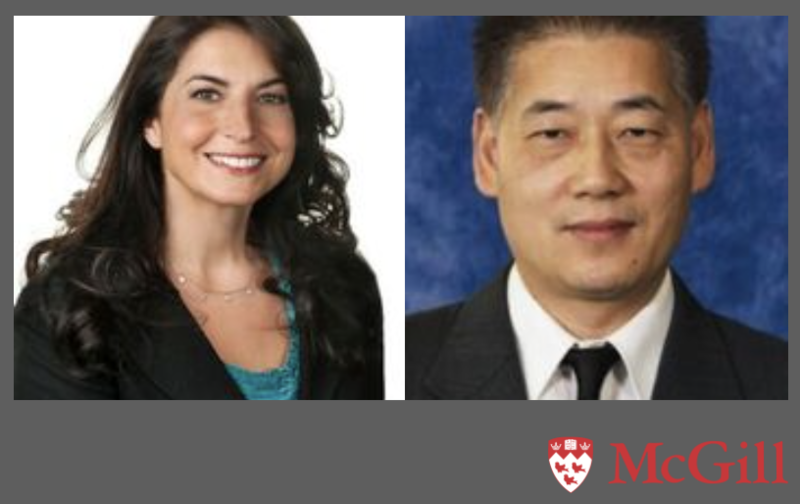 McGill chemistry professors Hanadi Sleiman and Chao-Jun Li are among the six recipients of this year’s Killam Research Fellowships. The two-year fellowships, awarded to exceptional researchers working on groundbreaking projects of broad significance, are valued at $70,000 a year. Prof. Sleiman’s project, DNA Nanostructures for Cancer Therapy and Imaging, will focus on treatment of triple negative breast cancer, an aggressive cancer type for which there are no FDA-approved targeted therapies. The aim is to develop structures made from the molecule DNA that deliver chemotherapy drugs to cancer cells without entering normal cells. These structures are biodegradable, non-toxic and designed to respond selectively to tumours. During her two-year fellowship, Sleiman will work to optimize these drug-delivery vehicles to eliminate the toxic side-effects of cancer chemotherapy, bypass drug resistance, and dramatically improve the quality of patients’ lives. Prof. Li’s project aims to find sustainable raw materials for chemical products. As fossil resources dwindle, cheap and abundant biomass waste from agriculture, forest, and seafood industries could potentially provide alternative feedstocks for chemical products. The main obstacle is the lack of broadly applicable and efficient chemical tools to transform highly functionalized biomass-based molecules directly and selectively. During his two-year fellowship, Prof. Li will seek to develop biomass-based feedstocks as widely applicable substitutes for conventional organometallic reagents.